Having survived the presidency of Andrew Johnson, I’m moving on to six biographies of our eighteenth president, Ulysses S. Grant. Based on his popularity toward the end of the Civil War it’s almost a wonder he escaped having his face chiseled into Mount Rushmore. Grant was a great military leader but he was not a savvy politician or effective president. Fortunately, presidential legacies ebb and flow over time and historians now consider President Grant “less bad” than at least a half-dozen of his predecessors (and several presidents since). Progress! Author and history professor Sean Wilentz, evidently a fan of the former president, has even suggested that no great American has suffered more cruelly and undeservedly at the hands of historians than Ulysses S. Grant. In deference to chronology, I’m beginning with my oldest study of Grant: “Grant: A Biography” by William McFeely. This book won the Pulitzer Prize in 1982. Like most Grant biographies it looks dense and heavy with about five-hundred pages and receives solid, but not exceptional, reviews. The third Grant biography I’m reading is Brooks Simpson’s 2000 “Ulysses S. Grant: Triumph over Adversity.” Simpson is a well regarded professor of history and a prolific author. But while his biography of Grant is widely considered one of the best, it also seems to be the least popular of the six I will be reading. Josiah Bunting’s 2004 “Ulysses S. Grant” is a member of The American President Series and comes in at one-fourth the size of the other books. Receiving only fair marks, it is likely to be the punchiest and most efficient but possibly the least penetrating. On poor presidents, brevity and potency can be a good thing. In the case of Grant I’m not sure how it will work out. I plan to wrap up Grant with H.W. 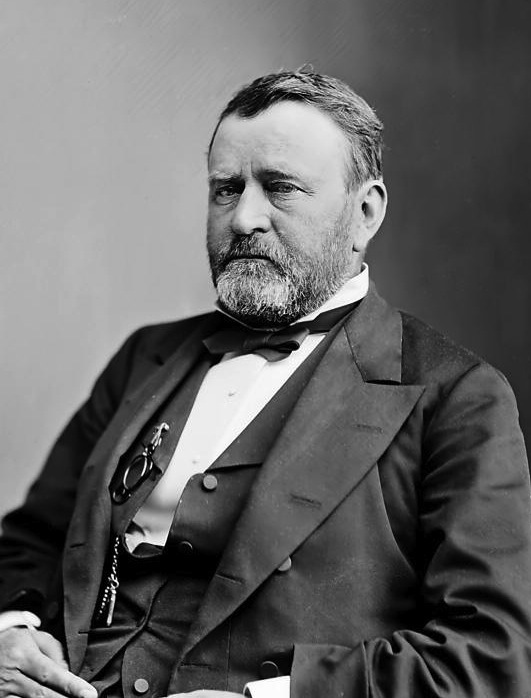 Brands’s 2012 “The Man Who Saved the Union: Ulysses S. Grant in War and Peace.” At over six-hundred pages this is another lengthy read but this biography is both well-read and well-liked. I’m interested to see whether this – as the most recent of my six biographies of Grant – will have anything new to say about Grant, or whether it will just prove to be the same story in a different wrapper. **It’s worth noting that both Ronald White, Jr. and Ron Chernow are writing biographies of Grant. White’s is rumored to be coming out late 2014 or early 2015, while Chernow’s is “tbd”. Both WILL be on my follow-up reading list. Rutherford B. Hayes – see you in late September! this website is dream come true. I’m reading about the presidents in order. this is a wonderful source. my reading is not as extensive as yours & much slower. I’m currently reading Hecht’s JQA. Good luck with Tyler. At the time he didn’t seem too boring, but in hindsight I’m surprised I survived the stretch from Wm Henry Harrison through Buchanan (except Polk who I found fascinating). Do you have a rough draft of your follow-up reading list? If by “rough draft” you mean “Post-it notes on my computer monitor and scraps of paper laying around in seemingly random places” then… yes I do have a draft of my follow-up list! I should probably bite the bullet and organize the mess before I get too far along. Then I’ll add it to the bottom of the master list and subject it to scrutiny by a wide audience – that’s sure to make it balloon in size, but at least nothing of value will go unread. I’m now reading the Lewis/Catton trilogy (Captain Sam Grant / Grant Moves South / Grant Takes Command) since I ADORE Bruce Catton, but the trilogy only covers to the end of the war, so I plan to follow that with Brooks Simpson’s Let Us Have Peace and The Reconstruction Presidents. That’s a lot of volumes. What do you read if you want a one-volume biography? The one BY JEAN EDWARD SMITH. It’s head and shoulders above all the others, in my opinion. I mean, I’m glad I read Perret’s book — he has some great insights about Grant (although you may not agree with all of his psychological theories about him); unlike most authors, he explains how battles work in a way even I could understand; and finally, Perret’s book is a nice corrective to McFeely’s book. McFeely is so biased against Grant that he even includes incidents that didn’t actually happen, treating fabrications or exaggerations by Grant’s enemies as if they were fact. I would reiterate that if you could only read ONE book about Grant, let it be Jean Edward Smith’s book. It is absolutely superb: balanced, thorough and beautifully written. I cannot recommend it highly enough. I just added Catton’s series to my follow-up list and was glad to read your views of several of the book I’m planning to read! I’m currently reading Perret’s book and despite widespread condemnation of its historical mistakes I’m really enjoying it. But I’m most looking forward to Jean Edward Smith’s book and your praise just reaffirms that.